The name of the clan refers to the triangular shape of the area of the Crater rim overlooking their territory. Their territory includes parts of the Crater rim. They therefore often spend time on the rim, the nearby lodges, and the headquarters of the Ngorongoro Conservation Area Authority. As a result, they are very cautious towards people and vehicles. They often compete with the Crater’s largest lion pride over preys. It is currently the Crater’s the smallest clan, but Triangle members manage to hold their ground against the neighbouring clans (Ngoitokitok, Forest and Shamba). 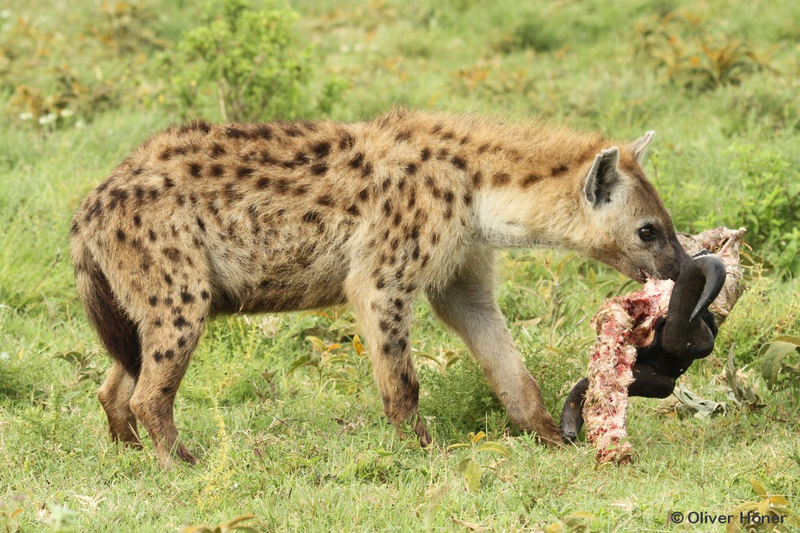 Tindi was born to a low-ranking Triangle clan female but despite his low social rank, he was always well-fed. With his nice spot pattern, his cute face and large, shiny eyes, Tindi was easy to identify and was one of our favourite males. Tindi emigrated from the Triangle clan at a young age together with his close friend Malindi. They joined the Munge clan but were not well received. Only three months after immigrating, they got involved in a fight with Majani, a male that had joined the Munge clan shortly before they did. The fight was rather serious and although Tindi and Malindi were not gravely injured, they both left the Munge clan and joined the Ngoitokitok clan. Things went better for them there and they were respected by the other males. The females however showed little interest in Tindi and he remained childless until the end of his life. Even Tindi’s death was tragic: one day, during a short feeding trip back to his home territory Tindi was caught and mauled by lions – we found him with his spine broken and many deep wounds. In addition, an investigation of his tonsils revealed, that he was infected with Streptococcus equi ruminatorum, a bacterium that caused the death of a considerable number of hyenas during a disease outbreak in 2002/2003. It is possible that the infection weakened him to an extent that he failed to run away fast enough from the lions.